Well, it’s July 6th and over the course of these past two days I cannot tell you how many people have been raving about the totally vegan and paleo friendly ice cream recipes that I had posted in our Philadelphia Medical Weight Loss Center these past several weeks. Yes you read that right! Low carb ice cream that actually tastes good! Many people told me that they served these ice cream recipes at their July 4th parties and everyone loved them. With that being said I am going to post these ice cream recipes here on our blog today. If this is your first time visiting our website and you would like more information on our medical weight loss program I invite you to call and schedule your complimentary weight loss consultation. Call us at 215-821-7336 and Lisa would be glad to schedule your first consultation. This is a phenomenal recipe all that you have to do is have to put your cocoa powder, Stevia, bananas, dates, one cup of ice and the tahini into a blender. Start the blender by pulsing it at first and then you could put it at higher speeds. very carefully add the remaining ice cubes until everything is Blended together nicely and you have a nice creamy texture. I usually do not need to use the entire 4 cups of ice but it will all depend on how thick you like your ice cream. You can even add a little bit of water to this if it becomes too thick and is not blending as well as you would like. Start by putting your vanilla beans, 4 ice cubes, coconut meat and maple syrup into a blender and begin pulsing this mixture. When it starts blending well together add the remaining ice cubes into the blender. Again remember that you may not really need to use all of the ice cubes. The meat from two coconuts. Here we go again! Start this recipe by putting all of the above ingredients into a blender with just about 4 ice cubes and start by pulsing the mixture and then turn it up to your higher settings on your blender. Very carefully and slowly and the rest of the ice cubes. once again remember you may not need to use all of the ice cubes. I usually only use about 10 ice cubes but some of our patients use more. I hope that you enjoy these recipes. 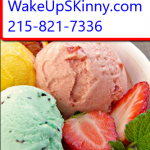 If you would like more information on our weight loss program or you would like to schedule your free weight loss consultation just call Lisa at 215-821-7336. This entry was posted in Medical Weight Loss, Medical Weight Loss in Philadelphia PA, Medical Weight Loss Philadelphia and tagged medical weight loss philadlephia, weight loss philadelphia on July 6, 2017 by Dr. Michael Kenny.